Aston Martin has opened the roof on its ultimate open-top driving experience; the new DBS Superleggera Volante. Combining three iconic nameplates in one flagship model, the new DBS Superleggera Volante delivers all the evocative talent of the British marque’s critically-acclaimed Super GT flagship – the magnificent DBS Superleggera – and blends it with class-leading convertible technology. The second Aston Martin to carry the Volante name following the introduction of the company’s Second Century Plan, DBS Superleggera Volante has been designed in-house under the guidance of Executive Vice President & Chief Creative Officer Marek Reichman. With the aim to create the most beautiful flagship Volante on the market, Aston Martin’s primary mission has also been to retain the coupe’s powerful dynamics, aggressive poise and astonishing performance. Powered by Aston Martin’s own 5.2-litre twin-turbo V12, producing 715BHP 900Nm of torque, and with a top speed of 211mph, the DBS Superleggera Volante boasts ferocious acceleration. While covering 0-62mph in just 3.6 seconds and 0-100mph in 6.7 seconds. DBS Superleggera Volante continues the aerodynamic masterpiece of the coupe model, commanding and exploiting the surface airflow to maximum effect. At the front, the car’s splitter and airdam work in unison, accelerating airflow underneath the front of the car to deliver true downforce and assist cooling by feeding air to the front brakes. The new deeper side strake draws more air from the front wheel arch to reduce lift and aid high-speed stability. Behind the front wheels, the ‘curlicue’ allows air to escape and flow smoothly along the car’s flanks, while the double diffuser at the rear allows air to exit cleanly and neutralise lift as efficiently as possible. A revised iteration - to accommodate the Volante’s clothed roofline - of the revolutionary Aeroblade ll system continues to deliver additional downforce at the car’s rear. At VMAX, DBS Superleggera Volante produces 177kg of downforce, just 3kg less than the coupe, an impressive feat when considering the car’s fundamental aerodynamic changes. Each dynamic driving mode brings its own level of noise too, feeding the level of emotional character and connection. In GT mode, the engine note simmers, but select Sport or Sport Plus and the acoustics become progressively more intense. Conversely, when you wish to be discreet, ‘quiet start’ offers a low-key alternative to DBS Superleggera Volante’s otherwise rousing flare of revs on start-up. Volante is a name that can only be attributed to convertible cars bearing the iconic Aston Martin wings badge, and thus the defining feature of any Volante is its roof. An advanced fabric system allows for an innovative and beautiful formed flowing roof line. Incorporating eight layers of insulation materials and acoustically enhancing materials, the canopy greatly improves the comfort of the interior cabin for all occupants when up, but allows a true orchestra of sound to pour into the cabin when retracted. 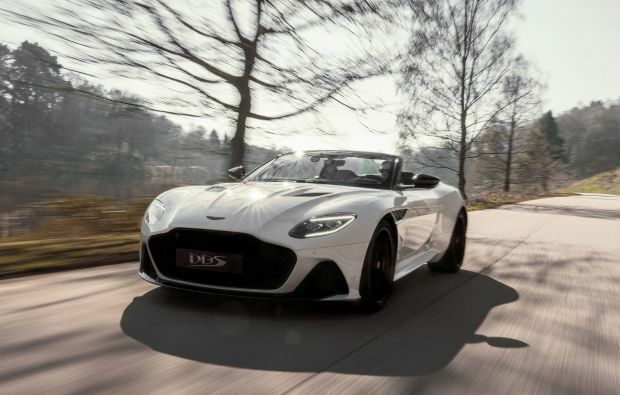 The authentic soundtrack delivered by the car’s powertrain is a critical hallmark of the Volante experience and typically, the DBS Superleggera Volante has been tuned to provide incredible sound quality synonymous with an Aston Martin Super GT. Equipped with a quad exhaust system DBS Superleggera Volante delivers a pure, harmonic and authentic voice, unmatched by its rivals. Aston Martin’s engineers have worked hard to ensure the best possible roof and rear package is achieved, while still delivering conflicting targets of styling and durability. With a class-leading stack height of 260mm for the car’s folded roof, DBS Superleggera Volante maintains a smooth seamless rear profile and maximised luggage capacity. Roof operation takes 14 seconds to open and 16 seconds to close and can be operated from inside or, for added convenience, from the remote key within a two-metre radius of the car. Continuing Aston Martin’s persistence for offering extensive levels of customisation, DBS Superleggera Volante’s hood is available in eight distinct colours including Bordeaux Red, Atlantic Blue and Titan Grey. The hood can be further personalised on the inside, with a further six Rokona headliners. For the first time on an Aston Martin Volante model, the window screen surround is available with a 2x2 twill carbon fibre finish, with the option to continue that theme to the car’s tonneau cover and rear waterfall. Large pieces of finely-woven carbon fibre pieces replace what was once swathed in leather and for the most exclusive specifications, tinted carbon fibre is also available for selection. Aston Martin Lagonda President and Group CEO, Dr Andy Palmer, said of the DBS Superleggera Volante: “There is nothing on earth that compares to the roar of an Aston Martin V12 and I believe that the DBS Superleggera Volante provides one of the greatest sensory experiences in the automotive world. This is truly a testament to the no compromise approach of our engineers and designers, to deliver the two key aspects of a convertible Super GT. Exceptional performance in an irresistible form, DBS Superleggera has justifiably won the hearts and minds of Super GT lovers the world over, and the Volante takes this concept to the next level”. DBS Superleggera Volante is priced at £247,500 (RRP inc Tax)* in the UK, €295,500 (RRP in Tax)* in Germany and $329,100 (MSRP inc. Gas Guzzler Tax)* in the US. Deliveries are set to begin from Q3 2019.